Patterns occur not only on the finished fabric as a visual design—they are integral to the structure of the garment itself. A single thread can generate complex geometric patterns that most people wearing the finished garment will never see with the naked eye or look for in the first place. In the Textile Research Journal article Hierarchy of Textile Structures and Architecture of Fabric Geometric Models (Lomov, S.V; Huysmans, G; Verpoest, I; 2001), it is posed that the hierarchical structure of fibrous materials influence the mechanical behaviour of textiles. A well-developed weave can result in sturdier fabric and a longer lifespan of the garment. Additional fabrics can also be added to make the inherent geometry of the weave varied and more complex, although this raises the possibility of structural inconsistency. There are a number of recognisable garments that utilise geometric shapes: the kaftan, the poncho, or the Pakistani jumlo (Shaw, M. 2006), and a number of high fashion designs draw on geometry to enhance and bring attention to different areas of the body (Fig.1). I decided to look more closely at how pressure and force can change the nature of geometry within textiles. 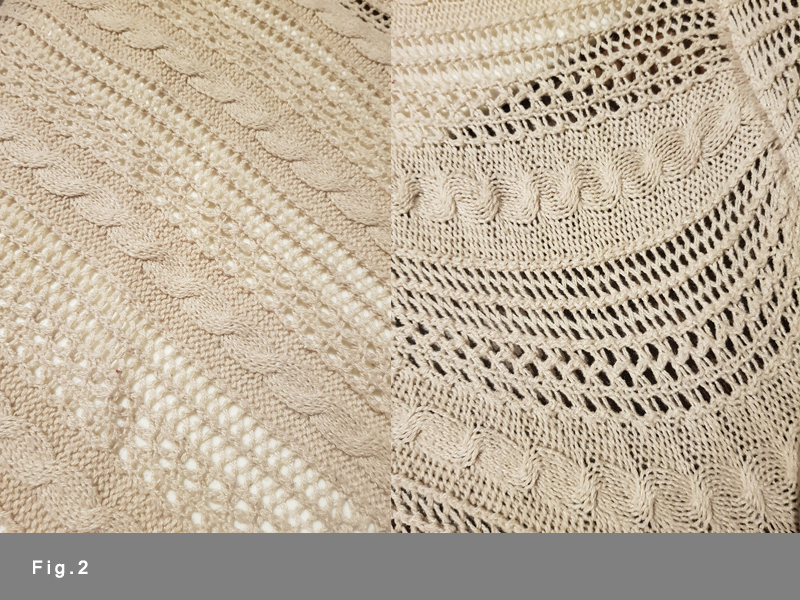 I spread one of my cardigans across a table and then took a photo of the fabric in its unworn, untouched state. Fig.2 shows the change in the geometry of the weave when the jumper was pulled at either side. A more obvious type of geometry that can be applied to a garment is the visual design and pattern, often created by using different colours or different materials. Repetitive pattern brings structure, gives flow and rhythm, and can be appealing visually and aesthetically (Perkins, M. 2015). During my research I wanted to know why we are drawn to geometric patterns and what it is about patterns that we find pleasing. Mathematician Ian Stewart says that we live in a universe of patterns (Stewart, I. 1998), from naturally occurring patterns in the makeup of plants, the formation of clouds in the sky, in topography, to genealogical patterns and the structure of our families. The patterns that surround us every day provide our lives with symmetry, repetition, order, movement and rhythm (Kraft, K. 2015), and it is hard to believe that patterns do not emotionally and intellectually influence us all in some way. Perhaps this is why we are drawn to structure and order; is necessary in society, and for many people it is necessary in day to day planning and living. Geometry, being present in many aspects of our lives, even down to the clothes we wear, could play more of a role in how we feel and what we think than we realise. If this is the case, then we instinctively look for recognisable or pleasing patterns as a way of choosing the safest, most beneficial course of action. It would be an interesting experiment to see if somebody wearing a geometric pattern and somebody wearing a randomised pattern influences how trustworthy or approachable others perceive them. 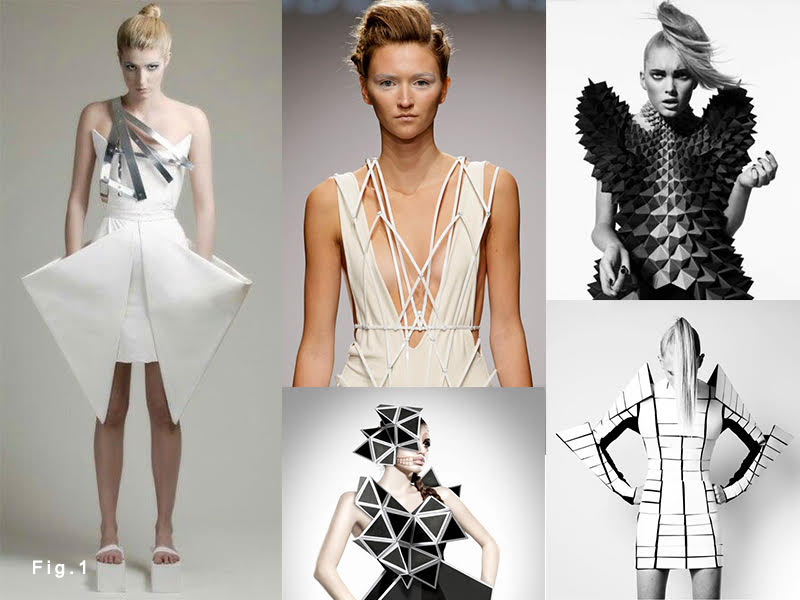 Through my research into geometry used in textiles I have discovered that there are a number of different ways geometric shapes can play a part in our garments and the fabrics surrounding us. Geometry is worth considering when creating a textile and pattern is important for a designer working with textiles. Additionally, geometry and pattern can be used to evoke different meanings and responses and also influence the integrity of a textile. As a result of my research I am keen to develop patterns that I can use in my own work and share as resources for other designers. In the past I have created patterns for clients (one was printed on a wedding shirt, which relates to the topic of this post) but I would like to approach pattern design with more clarity and focus, using the knowledge I have picked up from reading about patterns in textiles. Hekkert, P (2006): Design Aesthetics: Principles of Pleasure in Design. Delft University of Technology, Netherlands. Kraft, Kerstin (2015): Textile Patterns and their Epistemological Functions. Textile: The Journal of Cloth and Culture. Lomov, S.V; Huysmans, G; Verpoest, I (2001). Hierarchy of Textile Structures and Architecture of Fabric Geometric Models. Leiden University, Netherlands. Miao, Yuyang; Zhou, Eric; Wang, Youqi; Cheeseman, Bryan A. (2007): Mechanics of Textile Composites: Micro-Geometry. Department of Mechanical and Nuclear Engineering, Kansas State University, USA. Perkins, M. (2015): Print & Pattern : Geometric. 1st edition, Laurence King Publishing, London. Shaw, Madelyn (2006): Textiles and the Body: The Geometry of Clothing. Textile Society of America Symposium Proceedings, University of Nebraska – Lincoln.